UPDATE: The Brentwood Band appeared live with Paisley on the CMA Awards. The show was broadcast Wednesday, November 7, 2007 on ABC. Paisley won Music Video of the Year for "Online" and Male Vocalist of the Year. 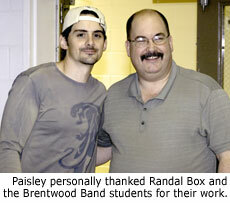 Country music star Brad Paisley's latest CD 5th Gear features a cameo appearance by the Brentwood H.S. Marching Band. A song titled "Online" makes reference to playing tuba in the Rose Parade, so Paisley's production staff had the idea to incorporate a marching band into the cut. Producers pitched the idea to Randal Box, band director at Brentwood H.S. which is located just outside of Nashville, Tennessee. When Box got the call, he was of course excited about providing his students a chance to play in a professional recording session. Having the Brentwood Band's name on a CD by an award-winning artist was an added bonus as well. Nevertheless, the time constraints provided a challenge. "We had just finished a concert two weeks before and had two weeks until the next concert, so the biggest concern was getting the chart learned," Box says. "They wanted the cut finished in about 10 days, so timing was crucial." The process moved quickly. The music arrived on a Monday and the band spent a total of about 45 minutes working on it. The following Monday engineers came to Brentwood H.S. for the recording session. 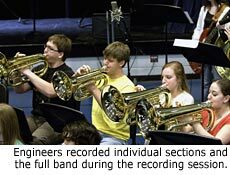 The engineers had the band play the music nearly 20 times, sometimes having individual sections play alone. The music was 22 bars, lasting about 40 seconds with repeat. The session lasted 65 minutes. "We turned the school auditorium into the recording studio because the engineers wanted a bigger room sound than in the rehearsal hall," Box said. "They were trying to find the spirit of a band playing at a football game, with your team leading by 30 points and a minute left to play ... something a little raucous." The music was a pep-band style arrangement of the main tune, arranged by Jay Dawson at Arrangers' Publishing. For the recording, Brentwood used its Symphonic Winds class which has about 72 winds and enough percussion to cover the marching battery. To give the sound an outdoor edge they used Sousaphones instead of tubas, and mellophones instead of horns. Box says the production staff hired a few professional musicians to sit in with the band, to make sure the students had a good model of what to do. "It was a thrill for the students to get to play with some of the best session players in Nashville," Box says. "I think those guys enjoyed re-living a few minutes of the marching band world they had all been a part of when they were younger as well." Paisley did not attend the actual recording session, but after the final mix was done he made a personal visit to play the song for the students. According to Box, Paisley was very complimentary of the students' efforts, and he brought a shirt for every band member. "He's a very personable guy and was very 'real' with the students, sharing some of his high school stories," Box says. "He said as soon as he walked into the building he was almost afraid some teacher was going to challenge him and ask him what he was doing in the hall." The students had also prepared a gift to give to Paisley: a Brentwood Band shirt autographed by the students. Depending on the success of the CD and in particular the song "Online," there may be more opportunities for the band to be involved. "We told Brad if he needed a band for the video, he knew where to find us," Box said. According to Box, Paisley mentioned the possibility of inviting the band to play the song with him on an awards show. "That would be an amazing experience if it materializes." The Brentwood H.S. Band has a long tradition of quality performances on a national level. The band is a consistent finalist at Bands of America Regionals, and in 2002 and 2006 was a semi-finalist at the Bands of America Grand National Championships. The band marched in the Macy's Thanksgiving Day Parade twice, including 2001 when the parade featured an emotional World Trade Center tribute. Other appearances have included the Fiesta Bowl Parade and National Band Championship, the Sugar Bowl, the Orange Bowl Parade, and the Philadelphia Thanksgiving Day Parade. For more information, visit BrentwoodBand.com. 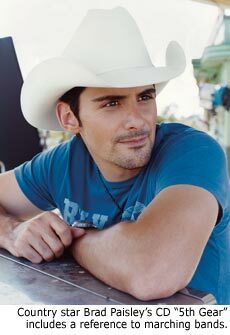 Photograph of Brad Paisley by David McClister. Photographs of the recording session and Brad Paisley with Randal Box by Tim Lumley.